The Inventory stock report is one of the most versatile reports because you can customize your query and you can see either stock items and/or bulk wine in a snapshot view as of a given date. Let’s review each of the filters, left-to-right and top-to-bottom. Show stock as at – default’s to today’s date but you may choose the date for the “snapshot” of your inventory; typically, this is run as a month-end report, but can be run at any time, as of any date. Stock type – If you want to see all of a particular stock type, choose from the drop down list. Owner – If you wish to see only those inventory items that belong to an owner other than your default, use the Search (magnifying glass) or type in the first few letters and press <tab>. Format – This is may be the most important option for this report. Choosing pdf outputs in this format and unless you have a pdf editor, you will not be able to make changes. Does not allow you to break out costing. Does not allow you to specify the volume equivalents for liquid stock (Show equivalent). Choosing csv output opens the resulting report in Excel. Once opened in Excel, you have its complete set of tools for data manipulation. Does allow you to break out costing. Does allow you to specify the volume equivalents for liquid stock (Show equivalent). Winery – If you are in a multi-winery set-up and are maintaining separate inventories, use the Search (magnifying glass) or type in the first few letters and press <tab>. You may use this filter for either csv or pdf output. Leaving this field blank will return all selected stock, regardless of winery. If you are in a single winery set-up, the winery field will be greyed out. 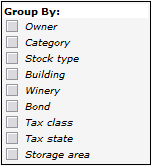 Building – If you wish to see inventory for a particular winery building (your Tasting Room, for example), use the Search (magnifying glass) or type in the first few letters and press <tab>. Show equivalent – Available only for csv output. Allows you to specify volume equivalents for your liquid stock items. Group by – if you have chosen the pdf output, you may use this option to control how the results are grouped. Note: you may select more than one option for grouping. 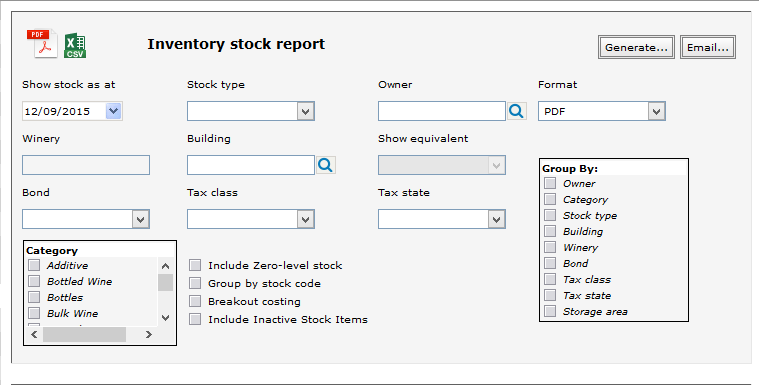 For example, if you check Owner and Stock type, your report will sort and group the results by owner (first) and then, stock type. This option is NOT available if you want to output in csv format (you can do your own sorting and grouping within Excel). Bond – If you are set up for multiple bonds and are maintaining separate inventories, and you wish to see only those inventory items that belong to a bond other than your default, use the Search (magnifying glass) or type in the first few letters and press <tab>. 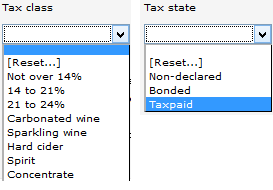 Tax class and Tax state – You may use either one or both of the drop down lists as filters. Category – This option is available for both output formats. Note: you may select more than one option; use the scroll bar to see all the options. Other filters/options – You may use these additional filters and options to expand your results (Include Zero-level stock and Include Inactive Stock Items), group your results (by stock code), or provide costing information (csv format output only). When you are satisfied with your selection criteria, click Generate or Email.